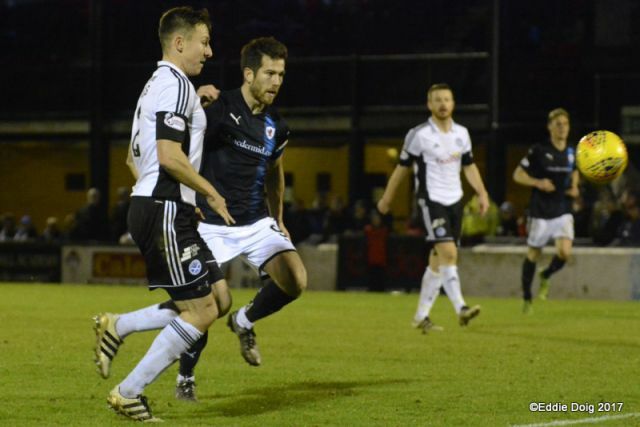 Somerset Park. A stadium unspoilt by time. 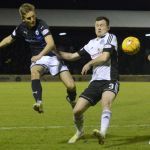 This has not been a happy hunting ground for Raith Rovers in recent years, and at full time a band of 140 travelling fans made the trip back home after seeing a gap open up at the top of the League One table. 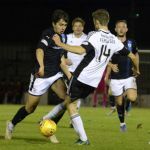 In the previous game between the sides, back in September, Lawrence Shankland had given the honest men the lead before goals from Lewis Vaughan and Jason Thomson sealed a victory for the Rovers. 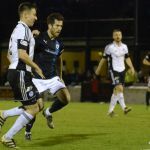 That game also saw the injury to captain Kyle Benedictus that has kept him out of the side for the last two months, and it is no coincidence that the early season fluency in our play has become a distant memory as the manager has been forced to continue shuffling the pack ever since. 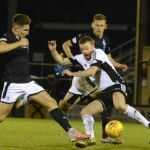 This game was no exception, with five changes to the team which bowed out of the Challenge Cup at the weekend – Iain Davidson’s injury meant he dropped out of contention, along with Greig Spence, Yaw Osei, Jamie Watson and James Berry. 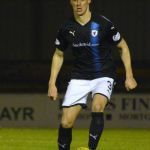 In their place Kevin McHattie, Scott Robertson, Bobby Barr, Dario Zanatta and Liam Buchanan returned to the first team to make up an experienced Rovers side. 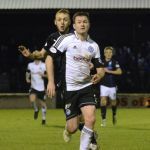 For Ayr United, the only change was Chris Higgins – red carded in the previous game between the sides – replacing Declan McDaid in the centre of defence. 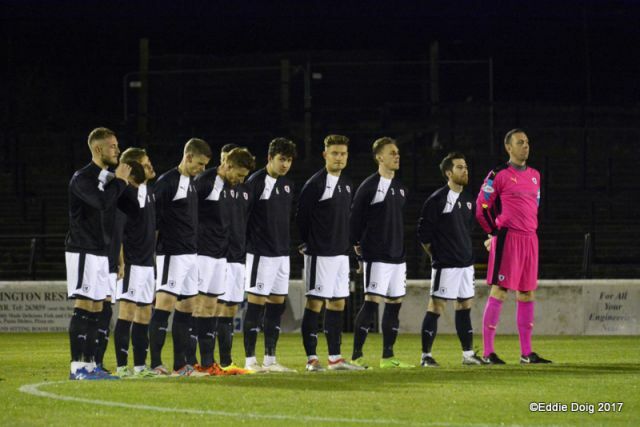 Both teams lined up in 4-4-2 formation, and the opening quarter of an hour was intriguing fare – a very competitive and fast-moving game, with both teams marking tightly and closing down quickly. 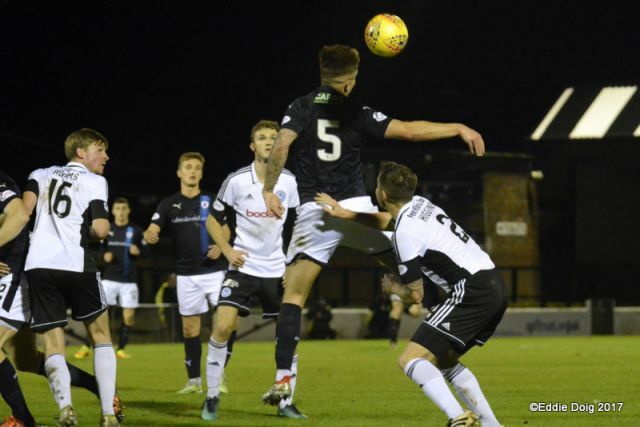 The conditions at first seemed perfect, with the Ayrshire coast providing mild, still conditions, but the playing surface was perhaps not as good as it looked from the back of the main stand. 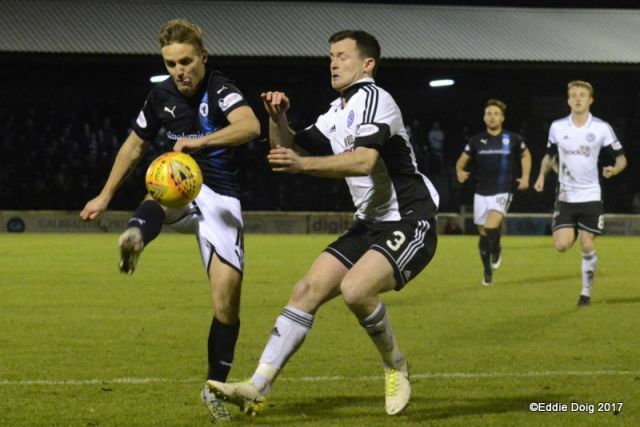 Indeed, in the second minute after both Higgins and Shankland had lost their footing, home manager McCall was heard to shout to left winger Crawford, “Robbie, ask him if he’s got the right boots on”. 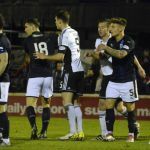 However, despite the possible soft going, Ayr’s play in these opening stages was more incisive than that of the Rovers, whose play seemed to focus on knocking high balls up to Dario Zanatta who could do little more than foul his marker on most occasions. 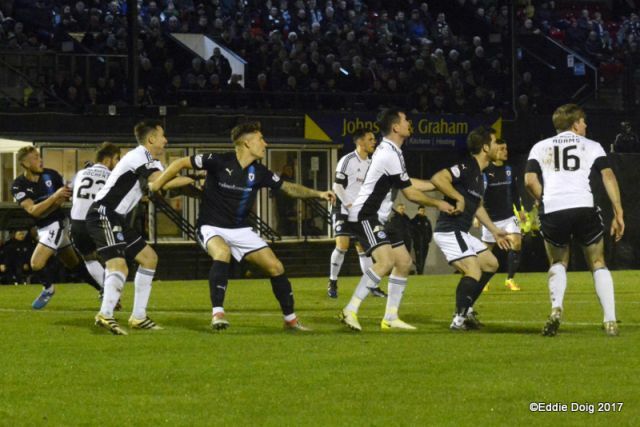 This prompted a reaction from the Rovers, for whom Vaughan and Barr had now switched flanks. In the 24th minute Zanatta received the ball with a defender in close contact, showed a great touch to twist away from him and fed Barr. He played in the advancing Thomson, but his cross was deflected and then hoofed clear. A minute later, Zanatta again got the better of his marker but pushed the ball too far ahead of himself and lost his footing in his attempt to catch up with it. Another Crawford run down the left channel and into the box took him right over the goal line, before Barr advanced down the Rovers left, turning Ferguson inside out, but he couldn’t create enough space to deliver a cross into the box. 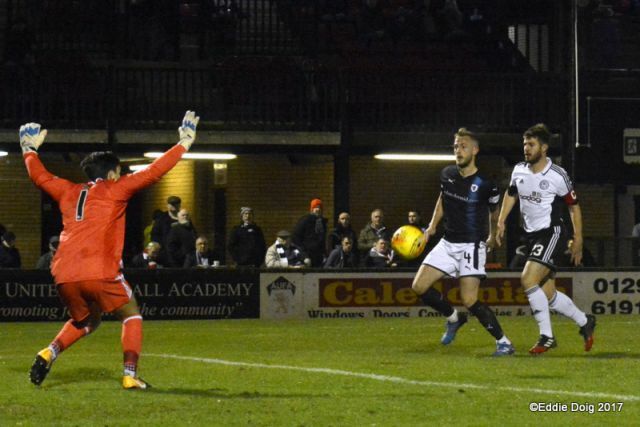 At the other end, Vaughan showed his willingness to help out at the back, nicking the ball away from Crawford before he lost his footing on the edge of the Rovers box. 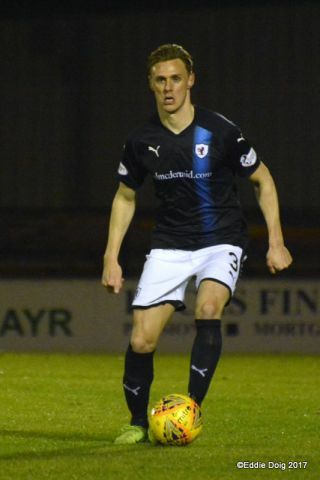 Moffat then became the focal point of Ayr’s forward play, with three attacks in quick succession – first twisting past Herron before Matthews slid in to clear, then taking advantage of lapse in concentration by Robertson to advance to the edge of the box where he fired over with Thomson in close attendance, and then finally unleashing a tame shot from the corner of the box straight at Smith. At the other end Crawford stumbled while receiving a pass out of defence, but with no Rover close enough or alert enough to capitalise he was able to recover and continue his clearance. 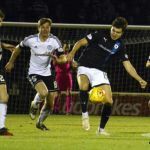 Three minutes before half time, Raith registered their first shot on target – a hoof up the pitch from Graeme Smith bouncing all the way through to his opposite number Hart in the home goal. 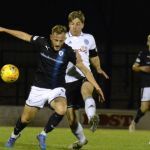 A dispiriting 45 minutes of football were topped off by a painful-looking injury to Lewis Vaughan, whose efforts in helping out at the back again were rewarded with having his right foot trampled on as he cleared. 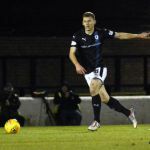 After watching him limp off field at the break it was something of a surprise to see him return for the second half, with no substitutions from either manager. It was Vaughan who had the first chance of the second period however. 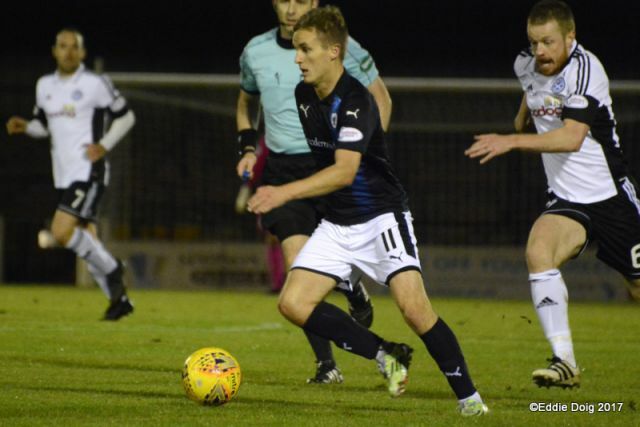 Raith flew out of the traps and in the opening seconds of the half, and after good combination play from Buchanan and Zanatta on the left of the pitch Vaughan surged into the box but could only find the side netting. 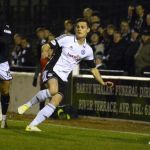 The next chance fell to Ayr, after a hefty foul by Matthews on Adams 25 yards out in a central position three home players stood over the ball. 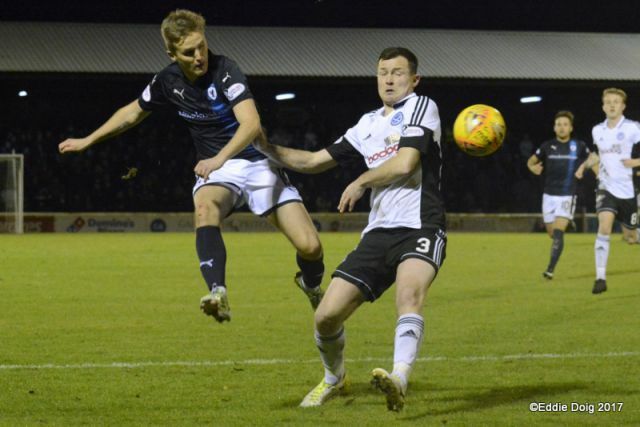 It was centre half Rose who took it, firing the ball past the wall. 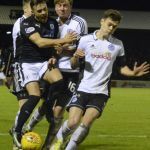 Smith parried the ball out, and with a number of forwards lurking Murray came to his aid, the defender and keeper doing just enough to scramble the ball clear for a corner. 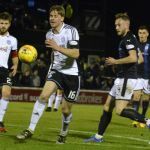 Despite Raith’s bright start to the half, Ayr were again first to everything, with their midfield bigger and stronger than their Raith counterparts. 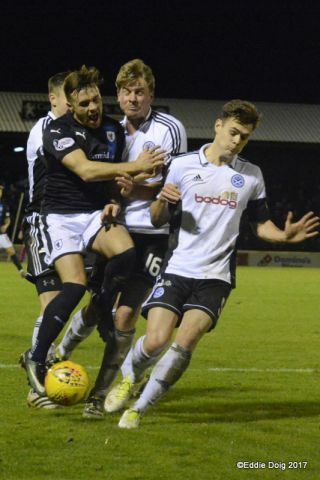 In the 51st minute Barry Smith addressed this, withdrawing the ineffective Zanatta and the terrier-like Matthews, whose vigorous performance looked likely to bring referee Cook’s cards out of his pockets before too long. 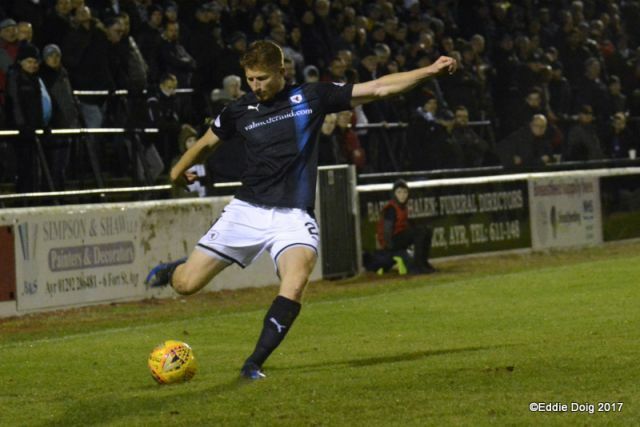 Jonny Court came on up front, and David McKay joining the fray in central defence, allowing Scott Robertson to move up into his more natural midfield berth. 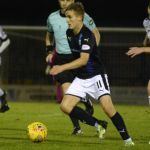 This led to the most encouraging period of the match from a Raith Rovers perspective, with our forwards at last getting service in to their feet, and Buchanan for the first time being the focal point of attacks. 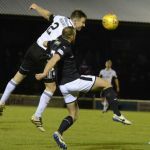 His ball in behind the defence to Barr almost created a chance for Court, but Boyle did well to block the cross, and then a Vaughan free-kick from deep found Buchanan at the corner of the six-yard box but he couldn’t direct an awkward header on target. 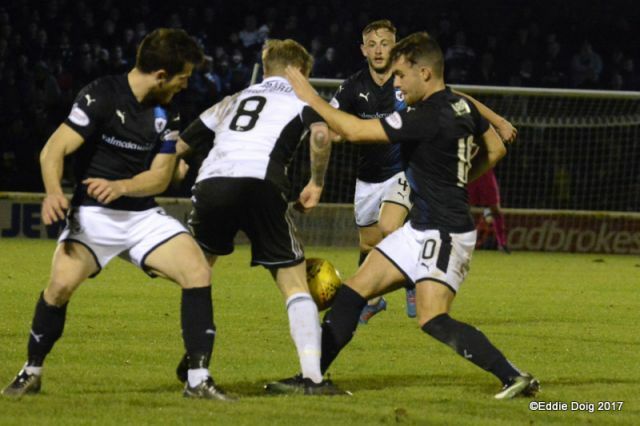 Minutes later the same two players combined, Vaughan’s cross finding Buchanan un-marked in the goalmouth. 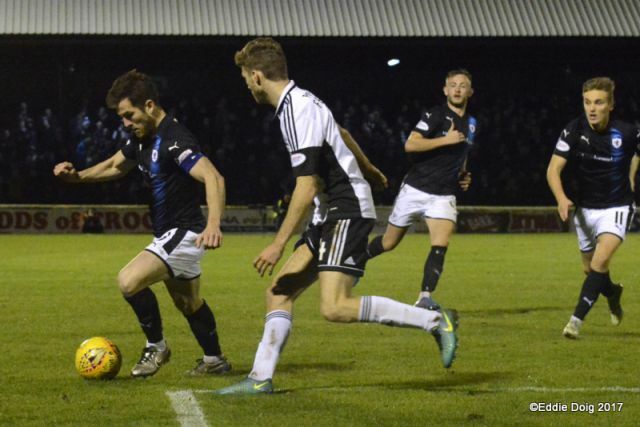 He netted the diving header, but was ruled offside. 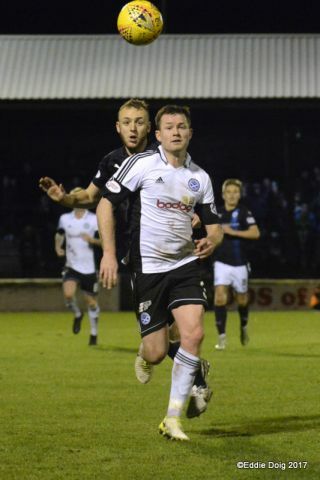 From the free-kick that followed Ayr made a lightning-quick break up the park, but Robertson did superbly to recover, showing a clean pair of heels to charge back and execute a perfect sliding tackle at the expense of a corner. 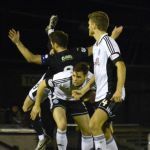 Around the hour mark, two great opportunities presented themselves to Vaughan – first Higgins was penalised for a foul on Court, and from the free-kick Lewis blasted the ball into the wall at a sensitive height. 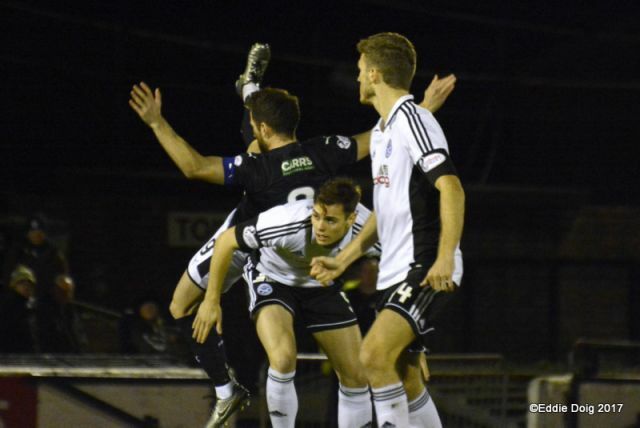 Minutes later Geggan was shown the game’s first yellow card for bringing Buchanan down a few yards further out from goal, this time Lewis cleared the wall but also cleared the goal and almost the stand! 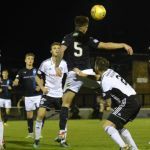 On 65 minutes Ayr were awarded a penalty for a foul by McHattie on Docherty on the edge of the box. 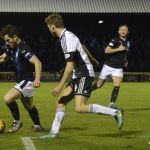 Unfortunately a pillar holding up the main stand roof was more visible than the challenge, but judging by the reaction by the home support it was a soft award. 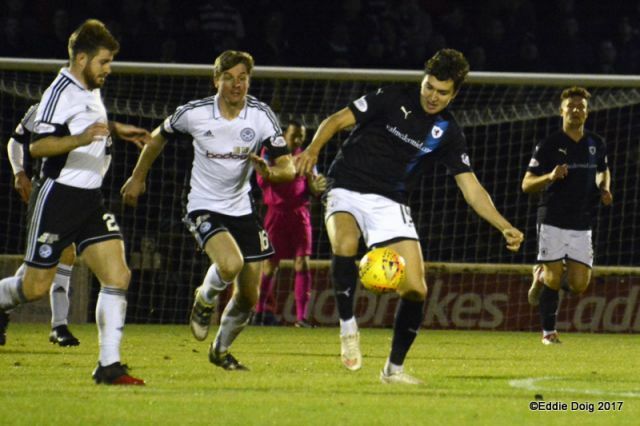 Moffat stepped up to take it, and skied the spot kick over the bar. 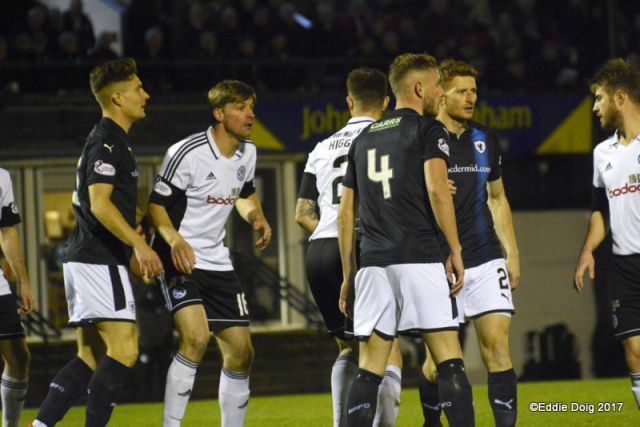 Moments later, after Adams was lectured by Mr Cook for preventing McHattie taking a free-kick in front of the dugouts, the Rovers manager, clearly still unhappy with the penalty award, was also spoken to by the whistler. 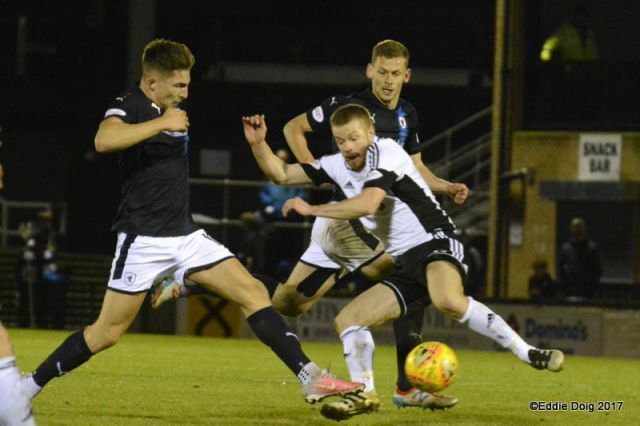 After a final half-chance for Moffat in the 70th minute he was replaced by Moore, whose first involvement in the action was to latch on to a long cross-field ball, Smith smothered the shot at his near post though. 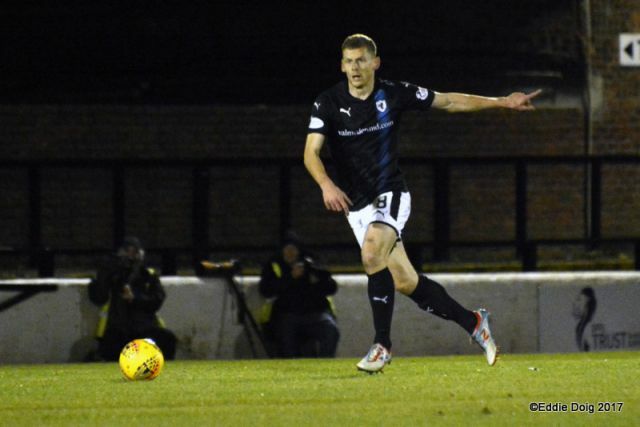 Greig Spence then replaced Robertson in the 80th minute as Rovers made their last throw of the dice, and minutes later he almost grabbed a goal – a good flick by Buchanan played him in, and his squiggler of a shot almost sneaked past Hart and into the bottom corner of the goal. Vaughan was now struggling again with his first half injury, but with all three subs committed he had to play on. 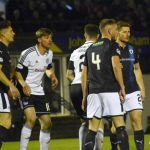 Court’s frustration saw him pick up a booking after he was penalised for winning a loose ball despite the attentions of two Ayr defenders. 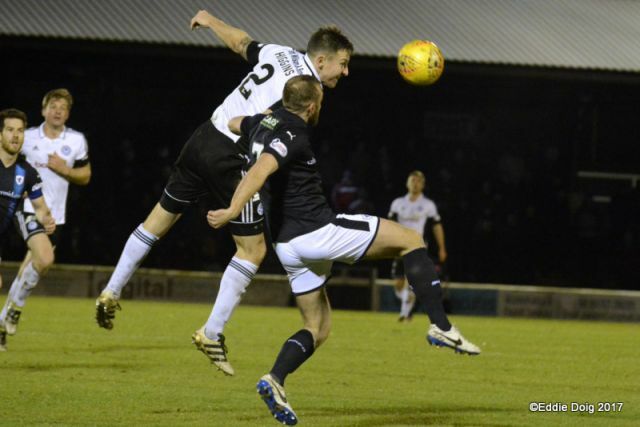 In the fourth minute of injury time Ayr put the game even further beyond doubt than it already was. 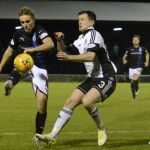 With Raith pressing forward desperately and Docherty lying in a crumpled heap in his own half; the ball was leathered forward for Geggan to chase. 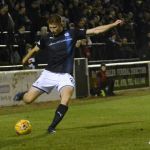 He gathered it in the right channel then pinged a cross to the back post, which substitute Moore nodded past Smith with aplomb before taking the rapturous applause from the home fans 3-0. 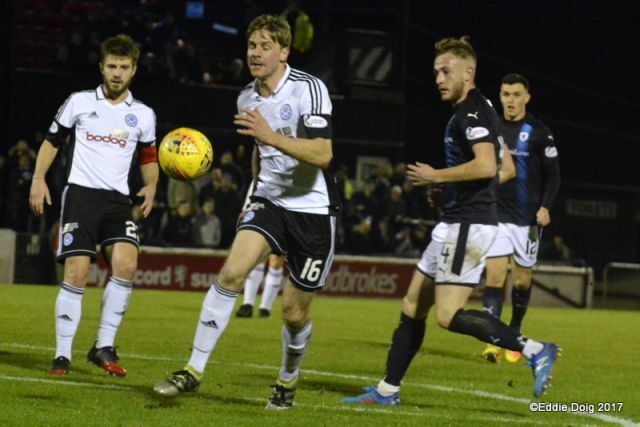 This turned out to be the last action of this table-topping clash, the final whistle sounding as Raith re-started play from the centre spot. 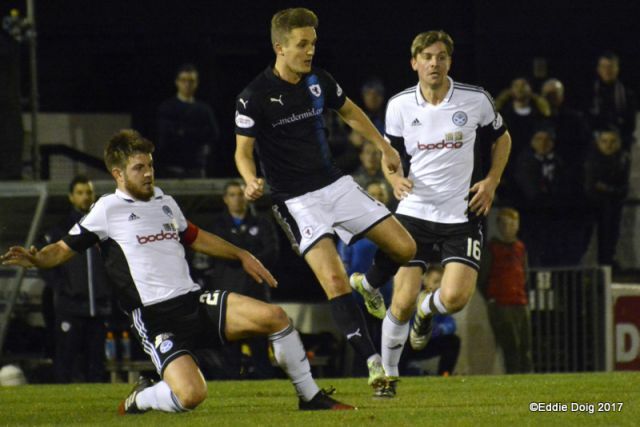 The defeat, remarkably only Rovers’ second in the league despite the patchwork nature of the team over the last two months, puts us three points behind Ayr, albeit with a game in hand. 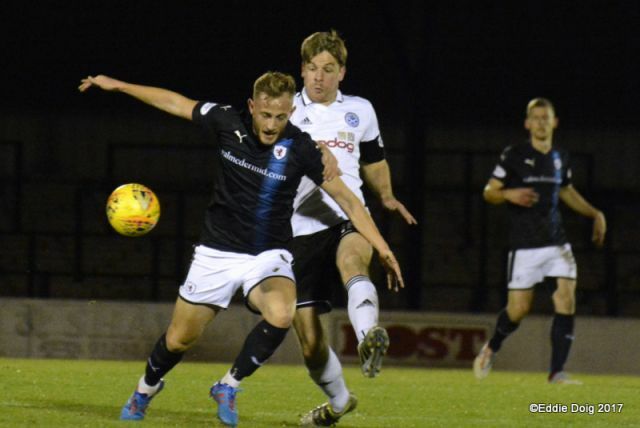 Both teams venture northwards on Saturday, with games against Peterhead and Banks O’ Dee in the Scottish Cup this weekend, before Raith have an opportunity to close the gap in their rescheduled match away to Stranraer next Tuesday. 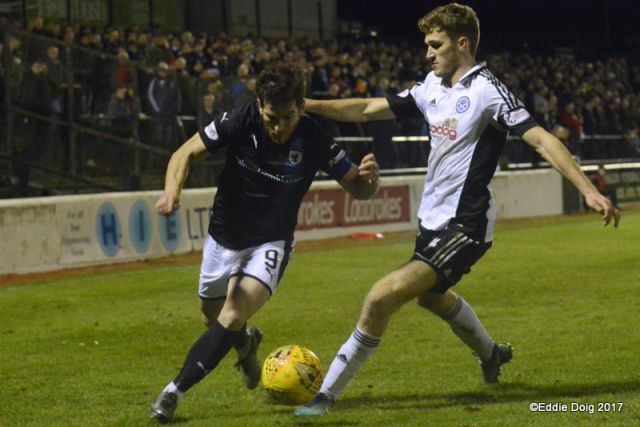 The distances involved in our away games this month make it unlikely that as many as the 140 who travelled to Ayr will make it to Stranraer, but every decibel of support the travelling fans can muster will drive the team onwards and upwards again. 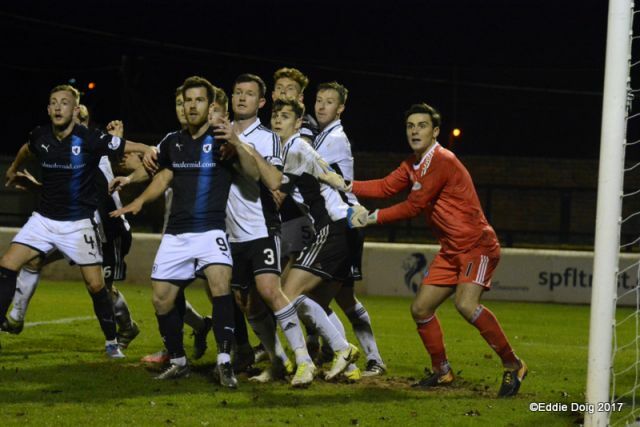 Ayr come close again. Moffat picks up a loose ball and drives forward. 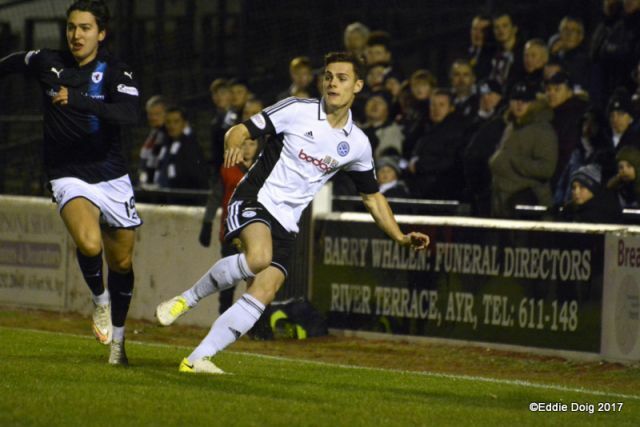 Ayr had much of the possession this half. 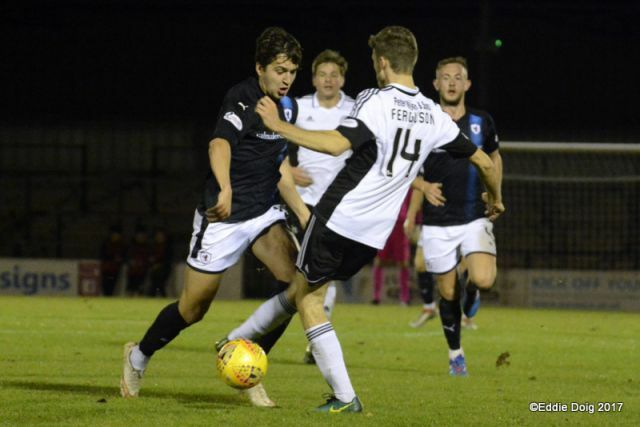 Ayr the better side for most of the match. 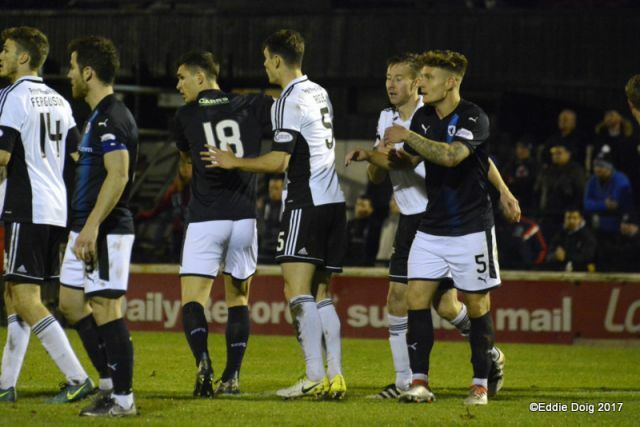 Raith second to the ball and struggled to fight back. 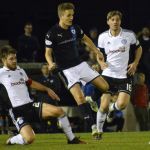 Raith Rovers will look to put their Irn Bru Cup exit behind them this Tuesday, when they travel to Somerset Park, for the rearranged League One fixture with top-of-the-table Ayr United. 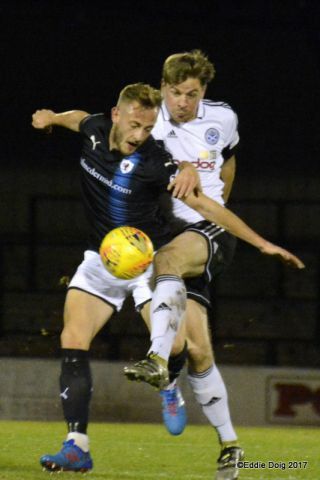 Ian McCall’s men are in exceptional form at the moment and are unbeaten since losing to Raith in the previous meeting between the two at the start of September. 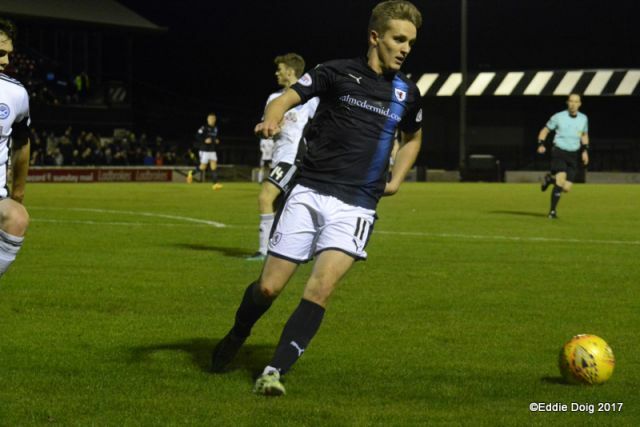 Rovers had to come from behind that day after Lawrence Shankland had put the visitors in front, but second half efforts from Lewis Vaughan and Jason Thomson, saw Raith emerge 2-1 winners. 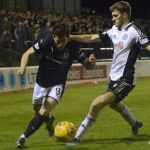 In the seven games since however, the free-scoring Honest Men have won six and drawn one, while taking their goals for tally to 35 in just 12 fixtures, allowing them to overtake Rovers on goal difference. 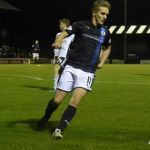 Raith had a mixed record at Somerset Park last term. 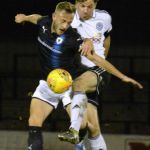 Goals from Ross Matthews and Ross Callachan gave them a win on the opening day of the Championship season, but the next fixture in February, saw Rovers lose 1-0, after arriving at the venue without a goalkeeper. 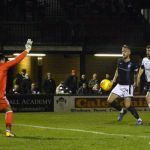 Rovers have the slightly inferior record over the most recent games between the two, with three wins and three draws from their last ten meetings. Tuesday evening’s match referee will be Barry Cook.